Managing Windows and Office Updates - SaaS Changes Everything! In fact, it can be easy to find which version of an application you are running. For purposes of this post, we will limit the discussion to Windows 10 and Microsoft Office, including Office 365. However, similar means exist for all software titles. An easy way to find which version of Windows 10 you are using is to use the “winver” command. Based on its name, as you might suspect “winver” is shorthand for “Windows Version.” To use this feature, just type winver in the Search box in the lower, left-hand corner of your Windows-based PC and press Enter. When you do that, Windows will display a dialog box like the one pictured below. As you can see in the highlighted section, I am currently running the 1809 version of Windows 10. When you see a Microsoft version number like 1809, you should know that the first two characters stand for the year Microsoft published the update and the last two characters stand for the month. Now, this version number is useful for more than just knowing when Microsoft published the update. Rather, you can go to https://docs.microsoft.com/en-us/windows/whats-new/ to see the new features Microsoft added to your version of Windows 10. 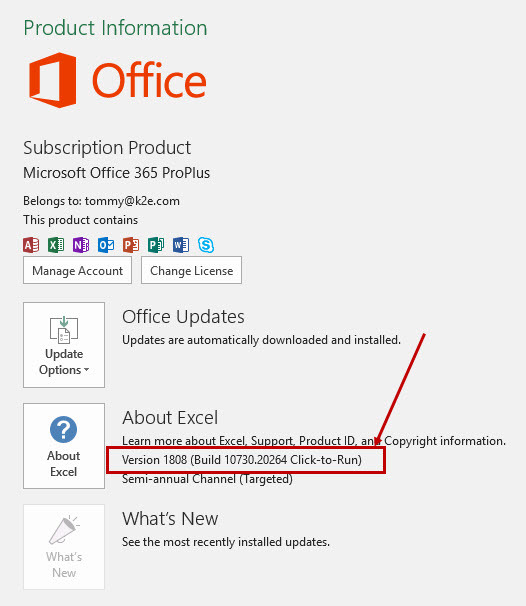 The ability to find version numbers extends to Microsoft Office too. However, the process is slightly different. To find the version of Office you are running, begin by clicking File on the Ribbon, followed by Account. You will then see your version of Office near the bottom of the dialog box that appears, as shown below. 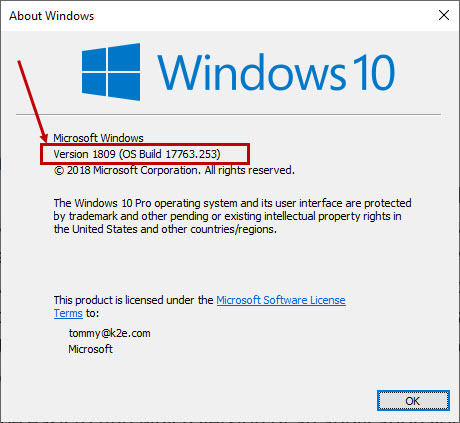 Like Windows, you can use this version number to learn more about the features that Microsoft added with that Office update. To do so, visit https://docs.microsoft.com/en-us/OfficeUpdates/index. With this information in hand, you are in a better position to decide whether you should proactively seek an Office update. The genie is out of the bottle with SaaS – it is here to stay! Therefore, we need to understand how to manage updates so that our software works the way we want it to work. One way of doing this is by understanding the features that are available with a specific version of an application, such as Windows 10 or Microsoft Office. This information will help you to make informed decisions about Windows updates and Office updates. As you can see from the demonstrations outlined above, this is a painless process. Therefore, take advantage of the information in this article to learn more about the features available to you in your instance of Windows 10 and/or Office. You can view the video near the bottom of this window for a detailed look at how to identify your version of Windows and Office. Interested in knowing more about Office 365 and its update process? Join us for "K2's Microsoft Office 365 - All the Things You Need to Know." Click here for more information.